My husband and I went grocery shopping today - yeehaa! What excitement! However, as we were lugging in the bags, I spied a moth on the front of the house. I instantly dropped all the bags (not too hard so as not to break anything), grabbed my hubby's camera, since it was handy, and started photographing. Hubby had gone into the house with some bags and wondered why I didn't follow. 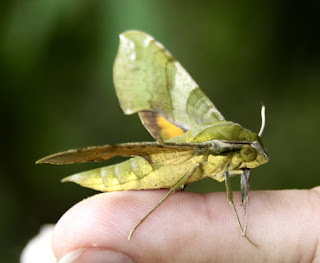 When he came back out, he helped by photographing the moth that I now had on my finger - beautiful!! By the way - I have no idea why my hand looks deforemd in the first photo - maybe my thumb was up by my finger? I swear I do NOT have deformed hands. He (or she?) 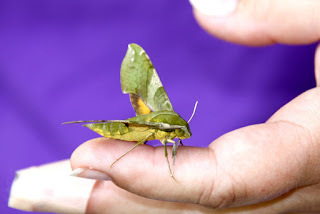 was so docile - I figure he must have just emerged from his chrysallis - AND they're nocturnal, so that accounts for the sweetness - and the fact that it didn't fly away. Now I'm stoked to get our black light outside at night - and see how many moths we get. Maybe next weekend, I'll nag my hubby to get it set up outside. 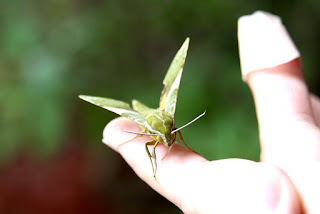 I read up about the Pluto Sphinx Moth and found out their larval food is Firebush, which I have in the front yard, the side yard and the back yard. Also, possibly, they like Pentas, which we have in the back yard. We have attempted to make a butterfly garden in the back yard, so this is an added bonus that we didn't even count on. And what a beautiful bonus!! Some of the moths are MUCH more glamorous than butterflies. 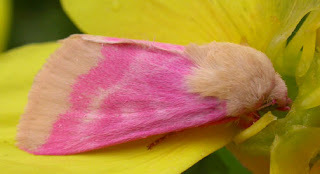 There's one that's like a Zha Zha Gabor moth - with pink wings and a feathery yellow crest. I'll know I've died and gone to heaven if THAT appears in my yard. OK - this is NOT my photo. It comes from this blog, which I've never read before - but doesn't that moth remind you of a pair of fluffy slippers for Zha Zha Gabor? Much like my quest for the Painted Bunting bird to come and eat from our feeders in the winter. Painted Buntings like underbrush, parks, secluded places - not city back yards, but I DID have a female here once, so there's hope. This lady gets them all the time in the winter. She lives only about 1 1/2 hours away from us, but those painted buntings are picky - and they like the country and they like the west coast of Florida better than the east coast . I love her blog and her photographs are FABULOUS!!! Anyway - Happy 4th of July (even though it's over) and may you have beautiful critters in your life too - if you like that sort of thing.